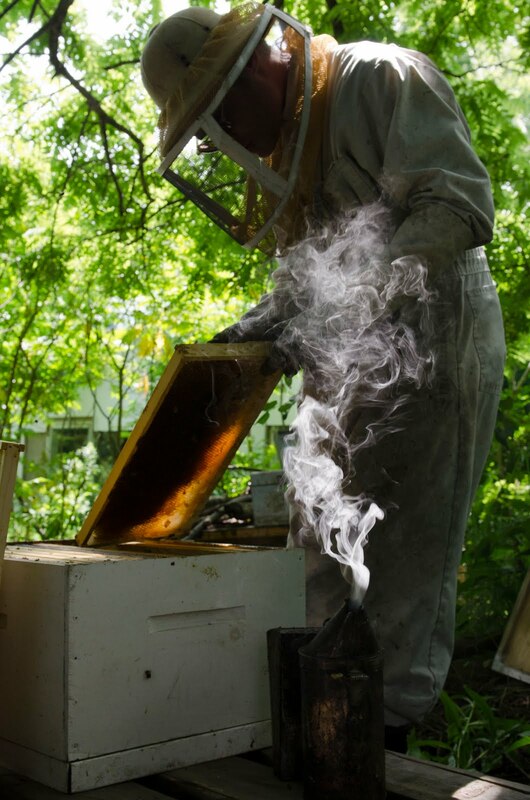 The honey harvest is in and we are hot and sticky all the time now. I've been experimenting with honey cocktails a bit this summer. This one is our lemon herb tea leftover from samples at the market. I added some honey which had been liquified in some hot water first to help it mix in better. Then I added an ounce of sloe gin that a relative in England had made and brought as a gift. It's made by steeping sloes in gin for a couple of months. I've also added cassis which is made from black currants and I made my own gooseberry syrup from our very small harvest of gooseberries this year. The syrup didn't have alcohol so it was good for the kids too and we could add vodka if we wanted to. I've also used our 5 mint tea as a base for adding to and it's lovely and refreshing. We've also been tasting some meads which has been lots of fun and is inspiring us to try to make our own. We bought some delicious ones in Vermont when we were on a family road trip at the end of July. We really like the ones that are just honey without any fruit added. You can taste the flavour of the honey better that way. We loved a sparkling one called Melissa from Honey Gardens. This is a dragonfly landing on a mullein. We were harvesting wild herbs in our field when my honey man spotted this lovely sight. I had a hard time getting a photo because it was quite windy and the mullein was really swaying back and forth. We use the wild mullein in our Queen Bee's Luxury Lotion, all of our lip balms and several of our herbal salves. We make an oil infusion out of it the same way we make all the oil infusions. We pack a mason jar full of fresh herbs and then fill it up with organic sunflower oil so that the herbs are submerged in oil. Then we leave it sitting in the sun outside for 6 - 8 weeks. The heat of the sun gently extracts the healing properties of the herbs into the oil. When we're ready to use the oil we strain the herbs out. The oil is stored with the herbs in it in a cool dark room. Here's Hazel holding a freshly picked St. John's Wort plant. We tried to get the kids to help us harvest herbs that day but it was so hot all they did was whine about going to the beach. This was a happy moment before we headed back to the house to get our bathing suits on. We harvest the whole St. John's Wort plant to make our Blues tea and just the flowers to infuse into oil for our Aches and Pains muscle rub. This is the field of buckwheat in full bloom. We got the seed from the Ottawa farmers' market in the spring and had someone grow it for us so we can try again to make buckwheat honey. Last year we tried with no success but we're hopeful that this year we'll have lots of strong black honey once it's finished blooming. A beehive will only work on one type of flower at a time and will keep on it until it's all finished blooming. That's how we can tell if we've got a honey from one type of flower. This is the lavender in full bloom at the Prince Edward County Lavender Farm. Our bees have been making lavender honey there for a couple of years now. You can buy our lavender honey from us or from the lavender farm. It's the opposite of buckwheat honey - very light in colour and flavour. And, no, it doesn't taste like lavender but it is delicious. This beautiful photo of my honey man hard at work was taken by Crystal Allbright who was visiting our friends at the Bloomfield Bicycle Company where we keep some of our beehives. She took a whole bunch of nice photos of him but I really like the way the smoke is wafting around in this one. I'm enjoying Mary Jane's blog Raising Jane. It's all about all things farmgirl. I've added it to my 'favorite things'.